More than 150 people walked to the Vermont statehouse on January 13, completing a 122-mile march that began in Brattleboro on January 2. The protesters were calling on the state legislature to close the Vermont Yankee nuclear power reactor. The reactor is owned by Entergy Corporation of Louisiana. "We are tired of Entergy and their toxic waste," said a jubilant Chad Simmons of Brattleboro, one of the marchers. The Vermont legislature will make history in a vote expected as soon as this month on whether to allow Vermont Yankee to continue operating after 2012. Never before has a state taken such a vote. "This is a tremendous opportunity for us," said Deb Katz of the Shelburne Falls, Mass.-based Citizens Awareness Network (CAN). "But it's not going to be easy." CAN helped organize the march, and works closely with the Vermont Public Interest Research Group which has a web site at www.VPIRG.org. Vermont Yankee is three miles from Massachusetts and a stone's throw from New Hampshire. A serious accident or act of sabotage at the reactor would kill thousands of people and leave hundreds of square miles of land uninhabitable. Like all nuclear power plants, Vermont Yankee contributes to global warming. The cost of storing nuclear waste makes nuclear power more expensive than solar, wind or any other source of electricity. Three years ago, the Vermont legislature passed, and the governor signed, Act 160, which gave the legislature the authority to decide whether Vermont Yankee can operate after 2012. Because of the way the law was written, the governor will not be able to veto the legislature's decision. Entergy has been pouring money into lobbying in anticipation of the vote. Entergy has run full-page ads in Vermont newspapers, and frequent radio commercials. But in recent years, some public hearings in and around Brattleboro on the reactor's future have drawn as many as 500 people, the vast majority of whom were in favor of closing the plant. Volunteers with the Vermont Public Interest Research Group (VPIRG), the state's biggest environmental organization, spent the summer knocking on doors and speaking with people about why Vermont Yankee should be closed. "We've been finding tremendous support for closing Vermont Yankee," said VPIRG director Paul Burns. "This will be one of the dominant issues in the next legislative session. Because of the way the prevailing winds blow, New Hampshire would probably be most affected by an accident. So we're getting support from people in New Hampshire and Massachusetts, too." Burns predicted that Entergy would outspend the antinuclear groups "1,000 to one" on lobbying and advertising around the upcoming vote. "But our odds are better than theirs," he said. "If there's any state where the public will can prevail in a fight like this, it's Vermont." Vermont Yankee opened in 1972 and was sold to Entergy by a group of New England utilities in 2002. The new owner promptly sought and eventually won regulators' approval to ramp up power production to 20 percent more than the plant had ever before produced. There have been a string of accidents at Yankee, including a fire in 2005 and last year's spectacular cooling tower collapse, which sent debris and hundreds of thousands of gallons of water cascading several stories to the ground. But so far, Entergy has been able to dismiss these problems as minor, since no one has been killed. To understand why so many people are volunteering so much time to try to close Vermont Yankee, one must look at the history of the nuclear power industry. There are now 104 nuclear power reactors operating at 65 locations in the United States. The nuclear power industry was created by the federal government in the mid-1950s, according to "Nuclear Politics in America" by Colorado State University professor Robert Duffy. The technology required to use nuclear power to generate electricity was invented by the same government scientists who invented the first nuclear bombs, which were used with devastating effect in World War II. In 1949, the Soviet Union became the first country besides the U.S. to detonate a nuclear bomb. Soon after that, Congressman Chet Holifield said, "We cannot be indifferent to the enormous psychological advantage that the Soviets would gain if they demonstrated to a tense and divided world the ability to put the atom to work in peacetime civilian pursuits. The United States will not take second place in the contest." At the time, there were no American companies interested in building nuclear power plants. Power companies considered coal-fired plants to be a better investment. And experts were predicting minimal increases in demand for electricity in the U.S. The Atomic Energy Act of 1954 effectively created the nuclear power industry. The government provided the industry with millions of dollars of free research, heavily subsidized fuel, discounted waste disposal, tax breaks and, perhaps most significant, taxpayer-subsidized insurance in case of an accident, since private companies were unwilling to provide coverage for radiation damage. The insurance was provided by the Price Anderson Act of 1957. Congress has renewed the Act approximately once every 10 years and it's still in effect. The importance to the industry of this taxpayer-subsidized insurance is illustrated by a 1982 study done for Congress by the federal Nuclear Regulatory Commission. The study estimated that a serious accident at the Indian Point nuclear power plant near New York City would kill 50,000 people, result in 100,000 "radiation injuries" and cause $300 billion in property damage. Following the partial meltdown of the Three Mile Island nuclear power plant in Pennsylvania in 1979, about 144,000 people who lived near the plant evacuated the area for several days. The number of people who died prematurely because of the Three Mile Island accident is disputed by experts. Estimates range from zero to thousands. Settlements paid by the reactor's owner to people who lived near the reactor required those who got the money to remain silent about the accident. In 1987, James Asselstine, then a member of the Nuclear Regulatory Commission appointed by President Ronald Reagan, told the New York Times that there was a 45 percent chance of a meltdown at a nuclear reactor somewhere in the United States by 2007. The accident at the Chernobyl nuclear power plant in the Soviet Union in 1986 has killed or will kill (from cancer) an estimated 9,000 people, according to a 2005 United Nations report. A threat by the U.S. government to get into the business of electricity generation prompted private corporations to build nuclear power plants. In 1957 Lewis Strauss, the chairman of the Atomic Energy Commission, said, "It is the Commission's policy to give the industry the opportunity to undertake the construction of power reactors. However, if industry does not, within a reasonable period of time, undertake to build the type of reactors which are considered promising, the Commission will take steps to build the reactors at its own initiative." The federal government had spent $1.2 billion developing nuclear reactor technology by 1962, more than double the amount the industry spent. In the mid-1960s, less than 1 percent of the electricity used in the U.S. came from nuclear power. In 2000, nuclear power reached its peak, providing 20 percent of U.S. electricity. As of 2005, that had declined to 19 percent. In the mid-1980s, the Nuclear Regulatory Commission (successor to the Atomic Energy Commission), whose members were appointed by President Reagan, changed its rules to allow new nuclear power plants to open even when state and local officials said there would be no way for people near the plants to evacuate in case of an emergency. Governor Mario Cuomo of New York called the change "absurd." Earlier, President Jimmy Carter's Department of Energy had agreed in 1977 to eventually take all the industry's "high-level" nuclear waste. It wasn't until 1987 that Congress had decided where the federal government would dump the nuclear waste that Carter had offered to take: Yucca Mountain in Nevada. The nuclear waste dump at Yucca Mountain still has not opened. The state of Nevada is doing its utmost to make sure it never does. The U.S. Department of Energy estimated in 2001 that the total cost of the dump would be about $58 billion. The waste is still being stored around the nation near the reactors where it was created—for example, in Rowe, Mass. In 1995, the National Academy of Sciences issued a report that said nuclear waste kept at Yucca Mountain could still be deadly in 1 million years. During that time, the waste will need to be watched 24 hours a day by heavily armed guards. Spending one dollar on energy-efficiency programs like Efficiency Vermont saves approximately three times as much energy as spending one dollar on nuclear power generators, according to a study by Amory Lovins published in 2005 by the journal Nuclear Engineering International. The dollar spent on energy efficiency also creates more jobs than the dollar spent on nuclear power, according to David Goldstein of the Natural Resources Defense Council. In other words, the study suggests, if New Englanders were to take the money we now give to Entergy for electricity from Vermont Yankee and spend it on programs like Efficiency Vermont, Vermont Yankee could be closed, our electricity bills would go down and there would be a net increase in jobs. Most of the electricity Vermont Yankee generates is used outside Vermont. Wind power and energy-efficiency programs are at least twice as cost effective as nuclear power at reducing the pollution that causes global warming, according to the Lovins study. Fossil fuel is used in constructing and dismantling nuclear power plants; mining, processing and transporting nuclear fuel; and transporting, guarding and storing nuclear waste. The massive steel and concrete casks that hold Vermont Yankee's waste will need to be replaced approximately once every 100 years for the next 1 million years. The old radioactive casks will then need to be disposed of. Between 1974 and 2005, the U.S. government spent on research and development (in 2005 dollars) $48 billion for nuclear power; $20 billion for fossil fuels; $12 billion for solar, wind and other sources of renewable energy; and $12 billion on energy efficiency, according to "Government Energy Technology R&D Budgets," a report by the International Energy Agency. But the government's energy investment strategy has arguably not reflected the will of the American people, hundreds of thousands of whom have taken to the streets to express their aversion to nuclear power over the years. On May 2, 1977, police arrested 1,414 protesters at the Seabrook nuclear power plant in New Hampshire. In June 1978, some 12,000 people attended a protest at Seabrook. In August 1978, almost 500 people were arrested for protesting at the Diablo Canyon nuclear power plant in California. In May 1979, in Washington, D.C., about 70,000 people, including the governor of California, attended a march and rally against nuclear power. On June 2, 1979, about 500 people were arrested for protesting construction of the Black Fox nuclear power plant in Oklahoma. The next day, 15,000 people attended a rally at the Shoreham nuclear power plant on Long Island; about 600 were arrested. On June 30, 1979, about 38,000 people attended a protest rally at Diablo Canyon. On Aug. 23, 1979, in New York City, about 200,000 people attended a rally against nuclear power. 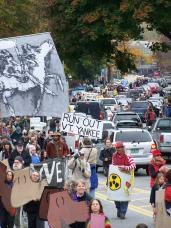 On Sept. 23, 1979, about 167 protesters were arrested at Vermont Yankee. On June 22, 1980, about 15,000 people attended a protest near the San Onofre nuclear power plant in California. Protests preceded the shutdown of the Shoreham, Yankee Atomic, Millstone I, Rancho Seco, Maine Yankee and at least a dozen other nuclear power plants. An article in the June 2007 issue of the Journal of American History did not hesitate to give protesters credit for the decline of the nuclear power industry: "The protesters lost their battle [when Diablo Canyon opened in 1984], but in a sense they won the larger war, for nuclear plant construction ended across the country in 1986." Bob Mulholland ran a successful campaign to close the Rancho Seco nuclear power plant near Sacramento, Calif. Rancho Seco was closed in 1989 because the people of Sacramento voted to close it. Mulholland, who now works for the California Democratic Party, told the Valley Post that the nuclear industry dramatically outspent the antinuclear groups in advertising before the referendum vote. "David can beat Goliath," he said. "We had a New England Town Meeting-style community debate and people saw that the industry was lying. Closing Rancho Seco was the best thing our community ever did."